Upgrade options may include accessories or personalization choices. Florists online provide a number of benefits that customers can use. Benefits include delivery services, upgrade options and bloom choice. When shopping for blooms, it is important to get the most out of them. Getting more out of flowers can increase the value of the arrangement. This can be important for anyone who needs to adhere to a budget. The first tip is to check for seasonal offerings the florist has. Seasonal blooms may cost less as they are currently being harvested. Knowing when certain flowers bloom can make it easy to plan bouquets. Some florists may list what seasonal blossoms are currently available. These selections often change for spring, summer, fall and winter. This makes it easy for clients to quickly locate these arrangements. There may also be seasonal favorites that are popular among clients. Examples of this include daisies and sunflowers for summer months. Orchids, cyclamen and poinsettias are often popular for winter. Taking advantage of these specials can make an arrangement affordable. These can also be improved by adding accessories such as ribbons. Personal message cards may also be added to create a touching gift. Many florists online offer different levels for their flower quality. These options typically include a basic, moderate and premium bloom. Upgrading or changing these can bring better results with bouquets. For those wanting a simple arrangement, a basic option can be used. These may not always include a vase, making it important to get one. Simple bouquets are ideal for those who already have ample vases. They may also be suitable for those wanting to surprise someone. A wrapped assortment can be held at a table when going out to eat. Roses or carnations are often the most popular choice for this type. 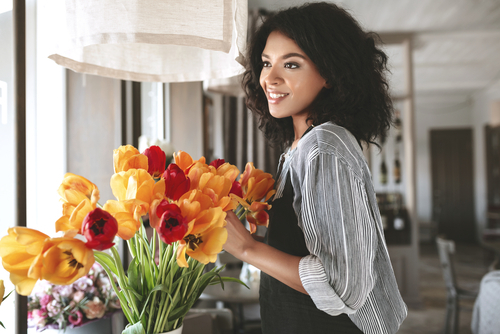 When flowers will be delivered to home or work, upgrading is ideal. These options often include a vase or container to display them in. The bloom quality is often higher for these premium display options. Additional options typically include gift boxes or stuffed animals. These may be used for a holiday or a birthday flower arrangement. Balloons can often be added for a youth bouquet or a get well basket. Planning ahead for a big event can help save both time and money. Planning an order ahead can often guarantee it will be ready on time. At least one week is recommended for large orders or special items. For those looking for wedding flowers, more notice may be preferred. This is important when many types of arrangements will be needed. Advance notice can ensure each bloom is ready for the special day. Another advantage to planning ahead is the chance for better prices. It is possible to find special deals on some bouquets before holidays. These are often listed on the website leading up to most holidays. Limited time offers may also appear before or after a big holiday. These may include standard or custom floral arrangements and baskets. To see what is available for an event check florists online regularly.